There’s a renaissance occurring in downtown Sugar House, what with the Sugar Hole finally beginning to be filled in and the opening of shops and new restaurants—including Habit Burger and Curry in a Hurry—springing up just west of the Hole, with more to come. One of the enticing new eateries is Flatbread Neapolitan Pizzeria. Formerly called Flatbread Community Oven, Flatbread is currently engaged in a rebranding effort, changing the names of its restaurants to Flatbread Neapolitan Pizzeria. The Flatbread outfit is based in Boise, Idaho, with a trio of stores in and around Boise, plus one in Bend, Ore., and, now, a restaurant in Sugar House. The initial appeal of Flatbread Neapolitan Pizzeria—for me, at least—lies in three letters: VPN. That’s the abbreviation for Associazione Verace Pizza Napoletana, an association with members throughout the world that certifies pizzas as being made within the approved guidelines of the VPN, including the use of “00” wheat flour, water with a pH of 6-7, sea salt, fresh all-natural yeast and condiments such as San Marzano tomatoes, certified mozzarella di bufala from Campana or fior di latte, fresh basil and so on. If you visit PizzaNapoletana.org, you’ll see that VPN pizzas even require an exacting technique for spreading the tomatoes onto the pizza dough, “using a spiraling motion ... excluding the crust.” Nothing in making a VPN pizza is left to chance; consistency is key. Up till now, the only Utah pizzeria that I’m aware of to gain VPN certified status was Settebello. Now, Flatbread has come to town, also toting VPN credentials. Look, if your favorite pizza is slathered with a pound of gooey cheese and pepperoni, none of this will matter. But, if you relish an authentic, thin-crust, nicely charred, Neapolitan-style pie, then Flatbread has all the right stuff. But, before I dwell on the pizza, it should be noted that there’s a lot more going on at Flatbread than just pizza. There are also appetizers, sandwiches, salads, pastas, desserts and, of course, flatbread. The flatbread and pizzas are all cooked in a gleaming, wood-fired Marra Forni brick pizza oven, which can reach upward of 900 degrees Fahrenheit, meaning that Flatbread pizzas can cook, literally, in minutes—and in the case of flatbreads, in seconds. For an exotic twist on traditional flatbread, try the chili-glazed shrimp & chorizo flatbread ($8.50), topped with Niman Ranch Basque chorizo and feta cheese. There’s also an interesting “Sunday supper-style” flatbread on the menu: pot roast & potato, which comes with rosemary-horseradish sour cream, caramelized onions and blue cheese ($8). By the way, Flatbread offers gluten-free flatbread for an additional $1.50. Among the appealing appetizers are hearty Sicilian meatballs ($8) in housemade marinara, ricotta-stuffed mushrooms ($8.50) with a blend of ricotta and goat cheese, wood-fired prosciutto-wrapped prawns with fig glaze ($9.50), and an Italianesque fondue: fontina fonduta ($8.50), which is fontina cheese infused with Pinot Grigio wine, served simmering, fondue-style, with house-baked focaccia. Salad options run the gamut from a classic Caesar ($10) and Caprese ($9.50) to a simple romaine salad ($9.50) and chicken, apple and walnut salad ($11.50). We tried the grilled-shrimp panzanella salad ($13), which turned out to be a bit of a misfire. For starters, there were only four medium-sized shrimp. I’d expected more from something called a “shrimp salad.” Panzanella is an Italian bread salad, wherein cubed rustic Italian bread is supposed to soak up the dressing and vegetable juices. This panzanella was, frankly, odd—it consisted mostly of spinach leaves, with a few tomato slices on top, some crumbled feta cheese and a handful of fairly large torn chunks of bread strewn around the outer rim of the big bowl in which it was served. As we dug into the panzanella, we found pieces of cooked chicken. Huh? Chicken wasn’t mentioned on the menu. When we inquired of our server about the chicken, he said straightaway: “I’m sorry, that’s not supposed to be in there. Let me go have a talk with the cook.” Fair enough. Soon after, the manager on duty came to our table, apologized for the errant poultry and offered to replace the salad with one done right. When our bill came, she had removed the salad from it. “It’s right or we buy,” she said. 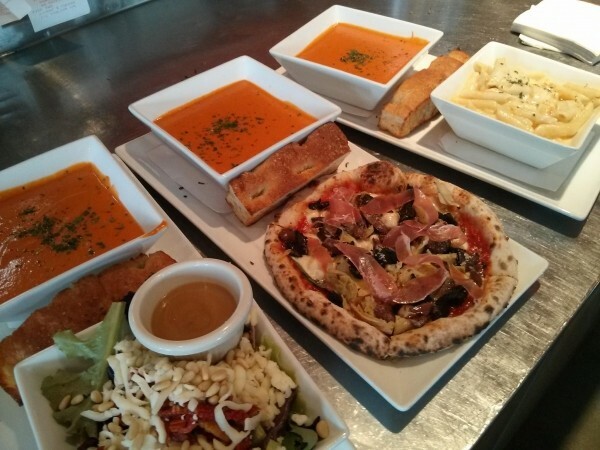 Which brings me to service at Flatbread Neapolitan Pizzeria: I’ve visited a number of times and have had nothing but stellar service from people like Jordan, Jared and Shaleel. Service is fast and professional, and the staffers wear T-shirts with whimsical slogans like “Char Happens” and “Fun Wine, Fine Pie.” The drink menu is labeled Dranky Dranks, and there is a really nice selection of them. There’s a range of $8 cocktails, including a Millcreek Mojito; plenty of canned, bottled and draft beers; and a wine list comprised mostly of special-order wines that aren’t readily available elsewhere in Utah. Flatbread also offers some tempting specials, including $10 pizzas (any pizza) on Tuesdays, Happy Hour from 3 p.m. to 6 p.m. and 10 p.m. to close (Friday and Saturday only), and a really good “pick two” lunch deal: choose from a personal pizzetta, half salad, half sandwich, mac & cheese and soup. I tried the Margherita pizzetta with a half Caprese di Parma sandwich (fresh mozzarella, prosciutto, fresh basil, pesto and honey-balsamic vinaigrette) and managed to eat all the pizza, but brought home most of the scrumptious sandwich to eat later. The pizza: It rocks. Char does indeed happen, and these perfectly cooked pizzas have gorgeous little char bubbles here and there. The Margherita is everything a Margherita should be and nothing else: crisp, charred crust; San Marzano tomato pomodoro; fior di latte; and a few fresh basil leaves—perfect. I also tried an over-the-top Carbonara pizza, which begins as a basic Margherita, with the addition of pancetta, grape tomatoes, red onion, heaps of arugula and a sunny-side-up egg. It was awesome, but the traditional, simple Margherita is awesomer. By the way, Flatbread donates a portion of every flatbread sold to local food banks. Can’t wait for the patio to open!